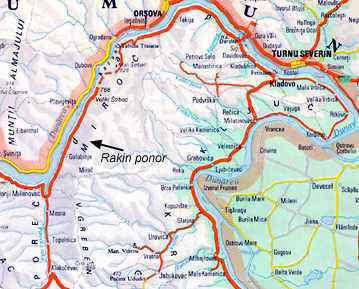 Rakin ponor is located at the western rim of Mt. Miroc karst, near village Kopana Glavica, 25 km from the town of Donji Milanovac. The entrance to the cave is at the end of a blind valley, at 380 m a.s.l. The cave drains a short periodical stream which sumps in it. It consists of a series of pits (with depths not exceeding 50 m) combined with horizontal passages in the middle portion of the cave. The cave ends in a steeply descending phreatic passage, filled with water at the bottom. The water level lays 54 m above of the present level of the Djerdap artificial lake, 7 km away. The cave has been explored by ASAK in July of 1990. Rakin ponor is also the very first of the Miroc caves which ASAK explored (it was the closest to the camp that first year). For some years it was believed to be the deepest Serbian cave (the first survey showed 278,5 m), until the resurveying in the summer of 1995 brought the depth of 256 m, which made Rakin ponor the third deepest cave in Serbia. In september 2000, cavers from SOB descended in Rakin ponor, carrying diving equipment. Aleksandar Milosavljevic made a dive at the bottom, reaching the depth of 29 meters. This raised the total depth to 285 meters, and Rakin ponor became the deepest (known) cave in Serbia.